CloudCheckr's Custom Cost functionality allows resellers to modify their Azure bill in order to fulfill multiple use cases when creating pricing for their customers. Charge VM usage at the regular rate even if covered by a reserved instance. Create bills for one or more subscriptions that reflect the agreed rate, regardless of the amount charged by Microsoft. Modify usage rates and add custom charges. You might see references to both Custom Cost and List Cost — they're the same thing! We've transitioned to using the name Custom Cost to convey that you can modify your price offerings in addition to the already-included changes to a CSP's list pricing. You can access Configure Custom Cost within your Azure account in CloudCheckr by going to Cost > Azure Partner Tools > Configure > Configure Custom Cost. When enabled, Custom Cost will be initialized based on Pay As You Go pricing during billing collection. This means that the costs are all reverted to what they would be if the customer purchased directly from the CSP. If disabled, any of your own discounts that have flowed down to your customer will remain. When enabled, CloudCheckr can unshare Reserved Instances to present a Custom Cost that is more accurate for billing each subscription. By doing this, you remove the customer confusion that ensues when Reservations are shared among unrelated parties. Prior to the latest Azure Reserved Instance offering, Microsoft had an offering called Azure Compute Pre-Purchase Plan (CPP). This offering allowed Virtual Machine (VM) compute hours to be purchased for a 12-month period. These pre-purchased hours were purchased at a discounted rate. Needless to say, juggling Reserved Instances and CPPs gets confusing. CloudCheckr has back-end logic to analyze the presence and amount of CPP and treat your billing data accordingly. Disabled: Disable Compute Pre-purchase Plan detection and unsharing. 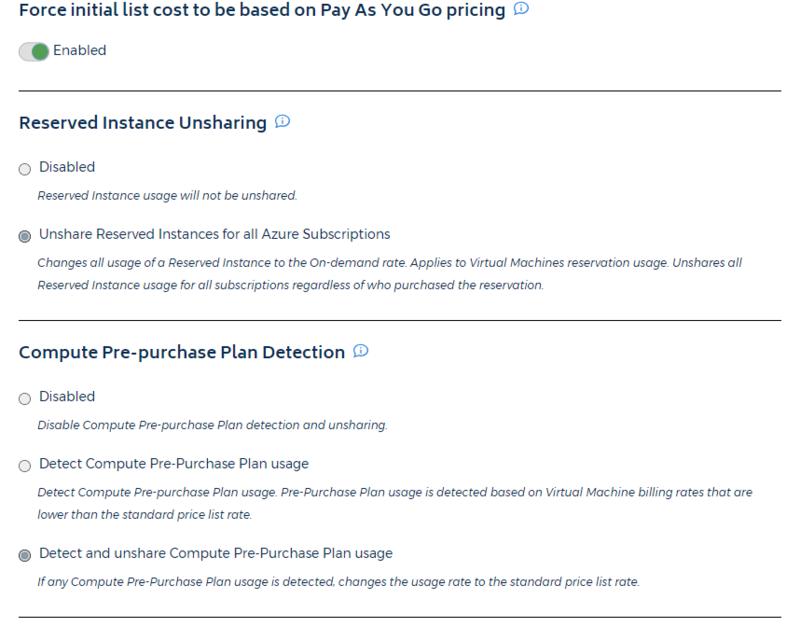 Detect Compute Pre-Purchase Plan usage : Pre-Purchase Plan usage is detected based on Virtual Machine billing rates that are lower than the standard price list rate. Detect and unshare Compute Pre-Purchase Plan usage : If any Compute Pre-Purchase Plan usage is detected, changes the usage rate to the standard price list rate. Below you'll find a reseller-ready sample configuration that strips away any default discounts and any unintentionally shared Reserved Instances / CPPs. Once this configuration is complete, you can move on to creating specific customizations around the discounts and premiums required for your business model. These configuration options determine how CloudCheckr builds your Custom Cost. If you change any options, you'll need to reload your Usage Report.